Swissport is the world’s biggest Cargo Services provider, offering award-winning Cargo Handling at more than 109 airports worldwide and handling in excess of 4.1 million tonnes annually. 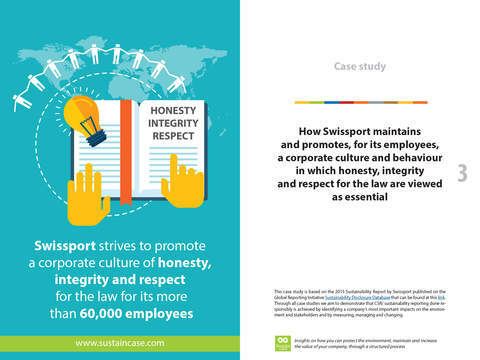 As a service provider and therefore a people’s business, Swissport has a big responsibility towards its employees and is committed to fostering a corporate culture of honesty, integrity and respect for the law. As the world’s leading provider of ground and air cargo services to the aviation industry, operating in a challenging industry where customer demands are high, Swissport strives to promote a corporate culture of honesty, integrity and respect for the law for its more than 60,000 employees. 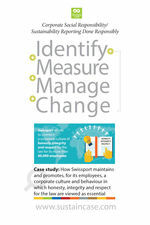 After measuring and setting targets, Swissport took action to implement a Code of Conduct, fight corruption, provide equal opportunities for its employees, ensure fair and equal pay, share information with Swissport employees, recognizing the legitimate role of responsible trade unions and employee representatives and, also, support employees through training and development programmes.